Jihad Watch : The 2012 siege of Kyauk Phyu began at the mosque near the edge of the Muslim quarter situated between two ethnic Rakhine areas, which is now an empty field. In order to reach the town center, ethnic Rakhines needed to cross the Bengali village. Adjacent to the now overgrown field remains a derelict house, which was shown to be the first house set ablaze, and it still had visible fire damage. Our guide was a witness when the Muslim violence in Kyauk Phyu erupted from the mosque. He told us that the Bengalis were firing deadly weapons called “jingalies” at the onset of the siege from the heights of the mosque. These jingalies are sharpened metal arrows made from bicycle spokes with barbs on the end to tear flesh, being launched from high-powered slingshots which can bury deep into flesh, penetrating vital organs, eyes, bone and muscle tissue. Here, jingalies were coated in poison from battery acid, with the intent to kill. Our guide said the jingalies shot from the mosque roof and minarets were like a rain coming from the sky, a hail of poisoned metal arrows. Bengalis fired 3-4 jingalies at a time on the frightened, defenseless villagers below. As the guide was hit in the leg, he ran for cover by a small water tower by the burning house, while he was trying to protect others from the attack. Ethnic Rakhine women and children were crying everywhere in the village. Villagers covered in blood were fleeing the scene with half a dozen jingalies sticking out of their bodies, easily penetrating their thin, cotton traditional clothes. Rocks and bricks were also being thrown from the mosque by the angry brigade of jihadists, hitting our guide in the head. Eventually the police arrived and called a face to face meeting between the Muslim and Rakhine leaders, which did not stop the ongoing violence. 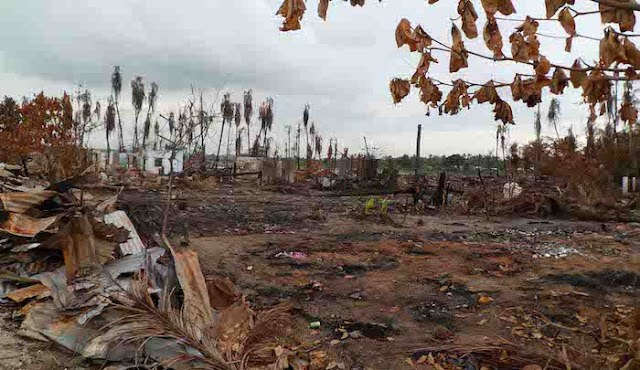 The attacks continued, as more houses were being torched by Bengalis, who were throwing fire bugs and Molotov cocktails at Rakhine houses. Fire bugs are metal rings covered with rope and cloth which is doused in petrol that was stockpiled on Bengali boats prior to the attacks. The magnetic rings will stick to the nails and metal in the houses. The Bengalis had long swords and big knives, which they use in the halal slaughter of cows, whereas the ethnic Rakhines had no such weapons for these purposes. The guide told us that after the insurgency, the Bengalis lied by claiming the opposite, that the Rakhines attacked them with long swords. There was no evidence of any swords or large knives in the possession of Rakhines during our stay in Kyauk Phyu, or Rakhine. Weapons are prohibited in Myanmar. Even Bengali children were trained jihadist fighters in the insurgency. One of the guide’s friends was found decapitated by a sword from this siege in an ISIS-style execution.